Here is another photo that I discovered on their site while looking at rugs. This rug is gorgeous and goes so perfectly with the sofa and pillows! 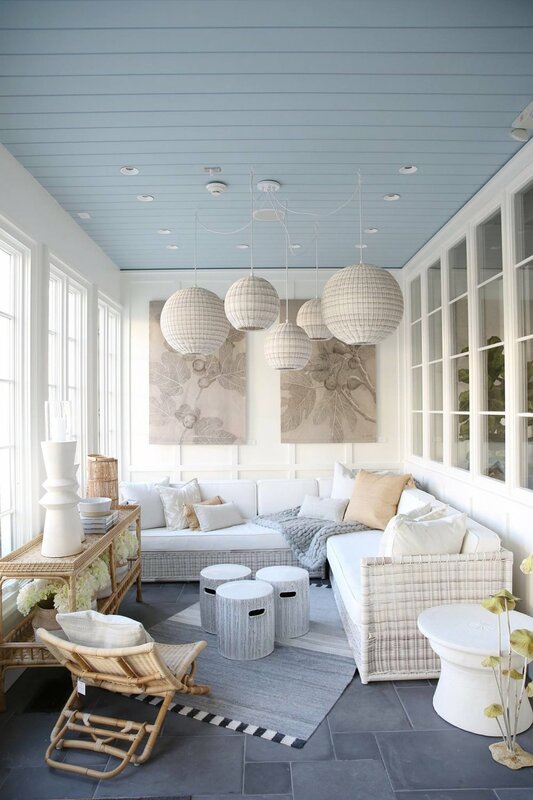 Of course I also love the island light fixture, exposed beams and ceiling details too! Oh and those chairs at the kitchen table are fabulous and go perfectly with the basket on the side of the sofa! I have a client who will be getting one of their rugs for her master bedroom so I can't wait to share the photos of her finished room in a few more weeks! I'd love to help you finish a room in your house or start from scratch on your space! The first step to working together is an in-home consultation so be sure to contact me to get started! Christie Adams Design is a Northern NJ (Bergen County) interior designer who works in the Wyckoff / Ridgewood / Glen Rock area. One of my favorite clients gave me the fun task of finding pillows for her family room. She already has her rug and a leather sectional in there. So I just needed to find the perfect pillows to complete the space. I love that her rug has a lot of different colors to draw from. I picked a dark green to bring in some color to the leather sectional. And then I picked a few different grey and soft, neutral colored pillows. Christie Adams Design is a Bergen County NJ based interior designer and decorator. Clients come from all over northern New Jersey (within 45 minutes of Wyckoff in Bergen County) which includes towns like Ridgewood, Glen Rock, Franklin Lakes, Allendale, Westwood, Hillsdale, North Haledon as well as Montclair and Westfield.